History is a wonderful subject as it tracks the developments of our world, filling in missing pieces and creating a larger picture of how we got to this point in life, especially when we pool together what has been going on globally. Take the wheel, without it where would we be today? The streets of Kathmandu would be a lot quieter! Stone-age man may have watched a round rock roll down a hillside and utilised the idea. However, the Sumerians, from the region between the Tigris and Euphrates, present day Iraq, were major players in inventing the wheel, man’s greatest invention. They are the ones credited for developing it for practical application. The earliest representation of a wheel is shown in pictures in 3000 BC. Some 5000 years later, it has resulted in some stunning machinery that biking enthusiasts like to put between their legs, which has created a life style, a sport and a massive worldwide industry that has also found a home in Nepal. In 1974 it was Mike Sinyard, a guy that rode a bike to school and home who moved from importing Italian bike parts to establishing the iconic bike company “Specialized”. With a culture of innovation it was his 1981 “Stumpjumper” (now enshrined in the Smithsonian Institution) as the first mass-produced mountain bike that really put peddles on the wheels (as far as mountain biking is concerned). From his shop floor in Marin County, in the North San Francisco Bay Area, U.S. across the Golden Gate Bridge, that became the birth place of the mountain bike. In the embryonic stages of the sport, it was guys like Gray Fisher, Charlie Kelly, Joe Breeze, Tom Ritchey, & Mike Sinyard that gave the sport a start. But in truth the origins of the mountain bike date back many years before, precisely in 1933, when Ignaz Schwinn (also in the United States) created a very robust bike: the “Schwinn Excelsior”. Its popularity quickly spread among newspaper delivery boys. Amazingly, just seven years after the Stumpjumper made its appearance on the world stage, it also appeared in Kathmandu about the same time. There seems little need to mention what mountain biking is; in 2011, it has blossomed into a highly participated off-road adventure sport that has enticed the Nepali youth to claim a strong standing in the international biking arena. These versatile machines of off-road terrain and the ground breaking races in Marin County lead to a week of competitions held in Crested Butte, Colorado, culminating in the crossing of the Pearl Pass (3,800 m) between Crested Butte and Aspen, with mountain bikes carried on ones shoulders for long stretches as the rider braved the adventure. In no time two crazed adventurers had set their attention on Nepal. In 1983, Craig Moffet and Brad Grunewald ventured to Everest Base Camp on their Himalayan Mountain Bike Expedition, and as such opened up mountain biking in Nepal with HMB opening its office in Kathmandu five years later. The first office of Himalayan Mountain Bike was located in the Kathmandu Guest House courtyard, another endearing landmark over these past 23 years and HMB put together the first ever mountain bike festival. The 3-day festival, held as a modest but inspiring event ignited conversations that started to spread stories of these multi-speed bike models that could take you places unimaginable compared to the traditional and more prominent Indian and similar Chinese models. HMB had gained its first Nepalese mountain bike guide (Sonam Gurung) and via some guidance and inspiration from his friend Greg Vann, they teamed up on biking trips during the first year of business. Sonam has been a worthy holder and ambassador of the title of being the first Nepali mountain bike guide and with the combined talent and athletic ability of an ex-Buddhist monk and kick boxer he fitted the position well. Again as time has proven, he retains a prominent and active place in the mountain biking scene today in his late 50’s, and is certainly a fitting role model to youthful riders. Although we never cast away experiences of the past Sonam would be recognised today for his biking talents and contributions rather than his past in martial arts. In those early days with HMB, he ventured back to his home village of Manang to give villagers their first sighting of a mountain bike and in the same year as HMB commenced its tours, he is credited with being the first Nepali to cycle/carry to Everest Base Camp in 1988. He also won Nepal’s first official mountain bike race organised by HMB (HMB Bike Festival) which brought a very modest cash prize of 500 rupees. Compared with the top prizes in the 2002 Himalayan Mountain Bike Championship, a 3-day Race Series which rewarded the winners with international flights, mobile phones and upwards of NRS. 30,000, it spells out the dramatic shifts in recognition of the sport in Nepal. By 1993 and HMB reaching five years in business, Francis was departing Nepal and the next chapter of HMB emerged with James Giambronie taking the helm as Managing Director and a lot of new developments in store. The Himalayan Mountain Bike Championship (HMBC) continued throughout 19993/94/95 and it was some exciting race photos taken from a helicopter in 1994 and published in an international biking magazine, that built a name and presence for the race. It was scheduled to coincide with the Annapurna Triathlon held in Pokhara by having the HMBC event the week before the triathlon. Triathlons were the new fusion sport dominating the world with its Swim/Ride/Run synergy of events and creating a new breed of super fit athletes which also blended well with a three person team relay. For many who were coming to Nepal for the Annapurna Triathlon, it became a good idea to travel a week earlier and participate in the HMBC. It was this combination of events on the Nepali sports calendar that saw the professional UK “Team Saracen” enter the HMBC Race and display the abilities of a top ranked team to the sports enthusiasts of the kingdom, which only inspired more interest in biking. 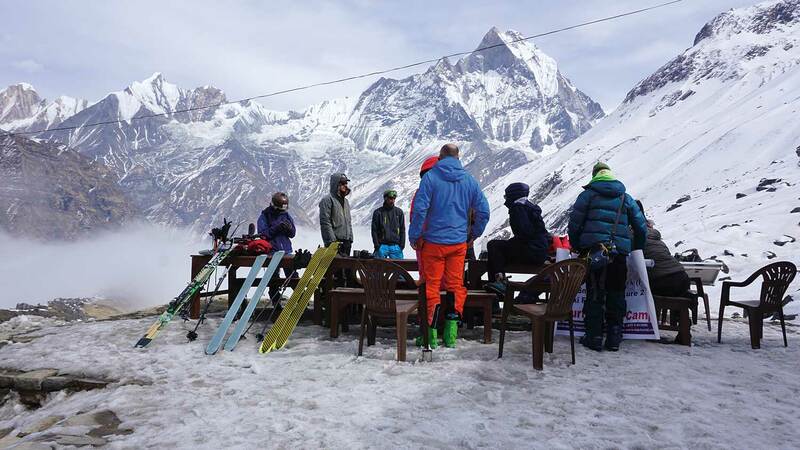 At that time HMB offered the first place Nepali winner, a place in “Team HMB” also made up of its other guides and staff, a sponsored trip to Pokhara. This event was won 4 years in a row by HMB and the very talented Nepal rider Rajbunshi being the first to win the HMBC and dominate the local scene for some years. By this time HMB had expanded its tours outside Kathmandu Valley, to include Pokhara, Tansen and the Dang Valley finishing up in Nepalgunj where clients went to Tiger Tops to finish the tours. In the 90’s, Kathmandu offered an almost unlimited range of biking trails commencing from the rim of the Ring Road, which is not quite so easy to do these days! James, who was already an avid trail rider around the valley, was able to convince other crazed adventure seekers to purchase bikes from those bikers coming to the Himalayas from Tibet or overland from India and encouraged them to sell in Kathmandu. This was probably the birth of the 2nd hand bike market and a very convenient way to acquire a good bike, otherwise a scarce commodity. As the number of riders built up and gathered for morning rides the famous Gear Wallah Club was created from James’s initiative and for many years became the focal point for locals exploring the valley, so much so that the first mountain bike tour guide book (Hikes & Bikes) was written by James. That tradition of the morning rides, especially on Saturdays, has spread to many such groups of mountain bike lovers. Not surprisingly, his first bike was the reputed Schwin (18 speed) which was upgraded for the classic Specialised “Stumpjumper” In the 90’s, his next ride was the first all suspension “Proflex” with its big yellow elastomers as shock absorbers after which the company K2 brought them out and the state of the art ‘full suspension” version entered the market. It would be fair to say that HMB was definitely the commercial pioneer of the sport and James the grandfather of mountain bike racing in Nepal when he sold the business after 5 years in 1997. An Australian adventurer, cycling enthusiast and Triathlete in Peter Stewart visited Nepal in 1995 and naturally gravitated to HMB, just at that time the Annapurna Triathlon was again being staged. With a recent World Cup Triathlon completed in Australia and the Hawaiian Ironman World Triathlon Championship some years earlier, Peter joined the HMB team in Pokhara. The lure of Nepal and the whole adventure scene was magnetic with its abundant trails and unlimited opportunities to explore, not just the physical adventures but also the fertile environment of Buddhist teachings. By mid 1995, Peter was managing HMB and in 1997 had decided that Nepal could well be his future home. It was in 1997 that again saw HMB enter a new age of adventure tourism from Nepal under Peter’s guidance and management. In the early 90’s, the only way to reach clients was by published details in guide books that offered a fax number. The fax enquiry would arrive and a typed reply would be printed and faxed back, and so it would go on until a booking was made, at a cost of about $7-9 per fax! In about 1996-97, with the amazing revolution of the Worldwide Web suddenly tour information could be published and electronic correspondence shared. It was just what tourism needed in Nepal to flourish. The amazing landscapes and physical challenge of crossing the 1108 kms of the Himalayas by bike, venturing from the Tibetan Capital Lhasa via Everest Base Camp into Kathmandu held great appeal and HMB lead the way with many yearly expeditions across the Tibetan plateau with full camping services and a crew of talented and trained guides. With a decade of experience and greater ease of marketing, HMB’s tours started to expand beyond the boundaries of Nepal. During 1996 and 1997, the promotion of biking as a profession was expanding and this included giving some recognition to the Rickshaw Wallah’s of Kathmandu City. With a talent for event management Peter created The Great Kathmandu Rickshaw Race organised by HMB and its Committee that saw more than 100 rickshaw wallah’s race over 10 events, sprinting down Durbar Marg starting from the Palace Gate that resulted in an elimination final of the ten fastest. Parades, marching bands and some 10,000 people witnessed the winner taking the Grand Prize of a custom built rickshaw, all sponsored by Kathmandu businesses whilst also raising money for an education fund of young kids. The winner became an overnight legend amongst his peers. In the winter of 1998 HMB pioneered Helibiking into the Nepal Himalayas when it signed up 24 enthusiastic and inspired expat-mountain bikers living across Asia and chartered a huge M-18 Russian Helicopter that would drop them & their bikes in Jomson. Over 7-days they would bike out after first reaching Muktinath. On the morning of the tour, departing Kathmandu they were blessed with sunshine after 10-days of non-stop snow and poor weather that left 4-6 feet of snow on the Jomson airfield and a glorious start to HMB’s pioneering spirit in Helibiking that continues today with several drop zones around the greater valley rim of Kathmandu allowing for the euphoric joy every mountain biker wants, experiencing a full day of downhill & off road trails. This first 10 years was just the starting point from which mountain biking in Nepal was about to take off. Stay tuned! This event was won 4 years in a row by HMB and the very talented Nepal rider Rajbunshi being the first to win the HMBC and dominate the local seen for some years.